"We have the technology." is licensed under a Creative Commons Attribution 3.0 Unported License. Permissions beyond the scope of this license may be available. Posted to Flickr on 29 July 2010. Have you ever wondered what my cyborg parts look like? First, in case you don’t know, earlier this year I became a cyborg to help battle chronic headaches. 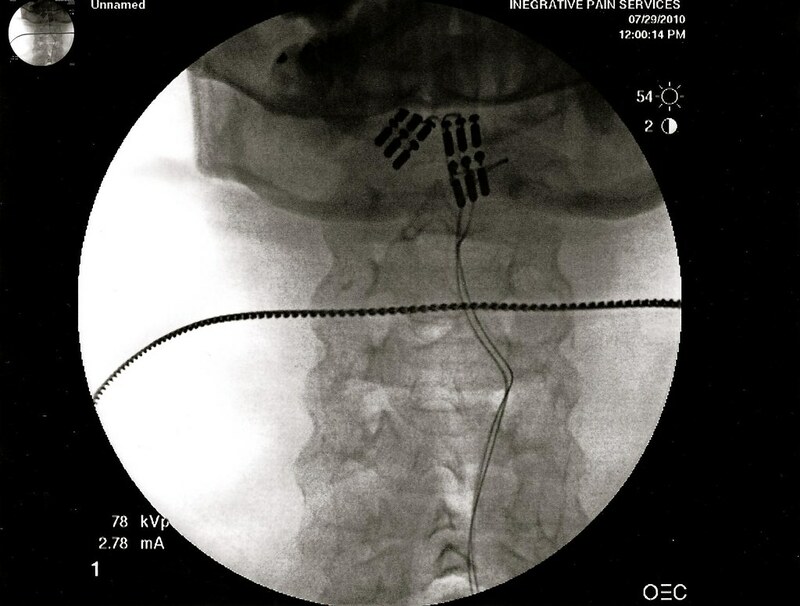 I had electronic devices implanted in my body that reduce my pain. You’re looking at an x-ray taken of the back of my neck earlier today. The darker mass at the top is the bottom of my head. The "equator" across the middle is the chain I wear around my neck, so that’s where my shoulders are. So the grey tube in the middle is my spinal column. If you look carefully, you can see the two little wires coming up from the bottom, snaking their way upwards, and ending at the two leads at the top of my neck. Each lead has twelve pins. Electricity is "arc’ed" between and among any of the pins. It’s this electricity that "scrambles" my nerves, confusing my brain into thinking there’s no pain. So which pins are used, how much power, etc. is determined by a "program" that is written by a technician. The technician works with me to save programs that are effective, and typically gives me several programs to use. Then day-to-day I can fine-tune the programs myself to a certain degree from a remote control device. For example, I currently have nine programs saved in my remote control, and I’m using program #8 as I write this. I know it’s not a photo, but some people have been curious about my cyborg parts, and I thought an x-ray would be a great way to communicate how they work. This photo was posted to Flickr on 29 July 2010. The last time I checked, it had 4,957 views on Flickr. The media type of this image is "photo." The original file type was "jpg." The photo's dimensions are 1024 x 776, giving it landscape orientation. "We have the technology." by JD Hancock is licensed under a Creative Commons Attribution 3.0 Unported License. Permissions beyond the scope of this license may be available.